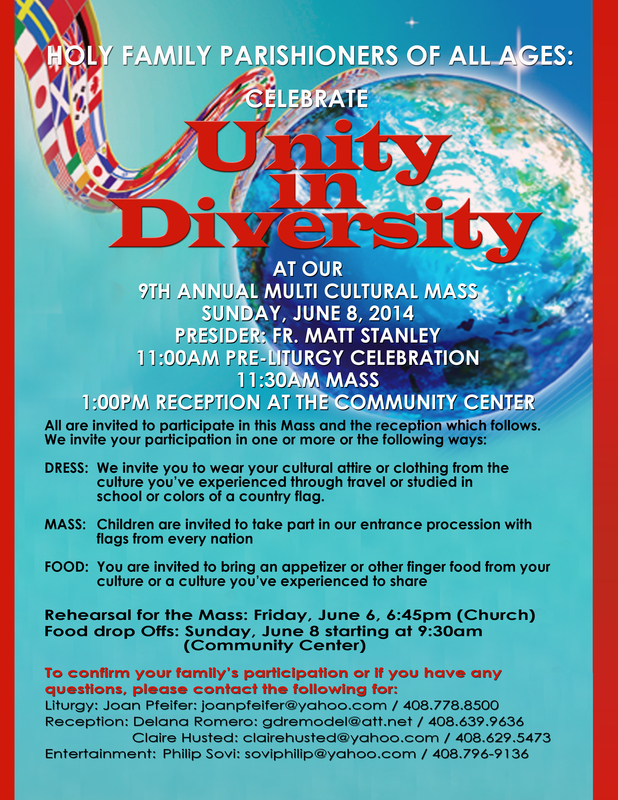 Our 9th annual Multi-Cultural celebration will be held on June 8, 2014. The mass will be preceded by approximately 25-30 minutes of liturgical cultural presentations starting at 11:00 am, which will proceed directly into the Mass. The mass will likely conclude at 1pm, and be immediately followed by a reception featuring food and entertainment from many cultures in the Community Center until approximately 4 pm. Anyone wishing to drop off finger-food contributions for the reception may do so by delivering them to the Community Center starting at 9:30am on June 8th. Please see the flyer for additional details.